The GReddy High Performance Damper Type-S suspension system provides exceptional handling on both race slicks or on regular street radials. Anticipating the product application for a new market vehicle, we were surprised to learn that TRUST had released the unit for an AE86. 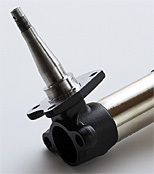 The AE86 front suspension system has a damper that rests inside the shock strut casing as well as the spindle (knuckle) assembly all incorporated into one piece. Because of this design, many AE86 enthusiasts were left to reuse the manufacturer strut casing when modifying the suspension. Typically, the aftermarket shocks slid into the stock casing and the springs rested above the unit. This was the normal suspension setup amongst many present day AE86s. However, 20 years has passed since the production of the AE86, the spindles are beginning to take its toll. Many are bent or have hairline fractures in them and sourcing another set can be very difficult especially as more time goes by. New strut casings are pretty hard to come across as well. Rather than to create a product that has to be used with the deteriorating stock components, TRUST had decided to produce a kit that replaces the entire front assembly. This suspension kit is a bolt-on unit that has an original strut casing already included. The preassembled spindles, shocks, and springs are a simple bolt-on ordeal. The rear assembly is a height adjustable kit that relies on spring perches. With this, the rear vehicle height can be matched up according to the stance of the front end. Tarzan Yamada gives us his impression in the street spec AE86 equipped with this new product! The front and rear suspension system has a screw type design to adjust the height of the vehicle. The height can be adjusted up to 6cm, with 8kg front and 6kg rear springs on the system. Pictured is the new spindle. The stock spindles most often are either bent or have cracks in them, causing unnecessary vibration throughout the car. Even replacing the hub bearings will not remedy the problem. Sporty Feeling ........ The industry is constantly developing better tires all the time, and up to now, I felt as though the AE86's obsolete suspension wasn't keeping up with the tire industry. But with this new suspension from TRUST, I believe they have caught up to the modern tire capabilities. With this new suspension, we are able to use the best tires on the market, even racing slicks and the suspension will have no problem keeping up. Ride Quality .............. I was a bit bothered by the stroke characteristics of the rear but I understand that this unit can also be used with racing slicks. The damper setting should take care of this problem though. I am very pleased with how the car is more stable and grippy around the turns. Cost / Performance .. For under 200,000 yen, this super efficient item is a steal. Considering the amount it costs to modify the stock spindles, it is well worth the money. Rather than use the damaged or brittle stock parts, why not use this new item that's more solid than a rock? Out of all the AE86s that I have ever driven, this is the most advanced suspension system that I have ever experienced. One thing that I must point out is how well this product allows the tire to grip the pavement. During stressful cornering, the vehicle hugs the road in a stable manner. My impression of the AE86 is that the driver has to be able to control the low capabilities of the machine, and that is the fun of the driving experience. However, this item substantially increases the potential of the vehicle. The new suspension setup does not necessarily surpass the vehicle mechanics either. It gently matches the suspension geometry that Toyota had designed. Although TRUST claims that the system was designed for racing slicks and all out race applications, it also performs great with street radials by properly setting the damper and spring rate. To enjoy both the circuit and the streets on an AE86, this is a must have item.